The single most distinguishing feature of the TAP® is that it can be adjusted by the patient while in the mouth by the use of a small detachable key until the lower jaw is brought forward enough to ensure the airway remains open during sleep. 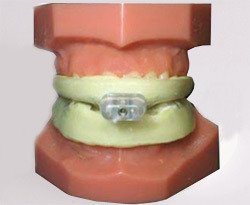 Once a comfortable degree of protrusion is achieved, the key is removed and the patient can completely close their mouth with the appliance inside. This unobtrusive, self adjustability is one of the reasons TAP® has a compliance rate of 95%. Patients are empowered to manage the degree of lower jaw protrusion over as many nights as it takes to achieve the optimal effect comfortably. 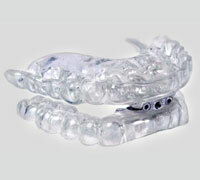 The fact that TAP® has a single point of adjustment prevents uneven bilateral adjustment which can create bite dysfunction. It operates on exactly the same principle as the custom TAP® and allows the dentists to provide an immediate treatment for OSA that the patient can begin using the same night as their visit. 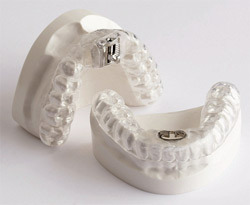 Furthermore, since the TAP®CS retails for about 30% of the custom model, it can be prescribed as a temporary or trial appliance to allow the patient to feel comfortable that the appliance is effective for them before they commit to a more costly custom appliance.